Residents protest, shut down Ogbomoso-Oyo-Ilorin road over 18 years non-completion – Royal Times of Nigeria. 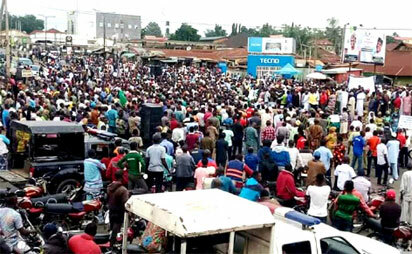 Earlier on Wednesday, hundreds of Ogbomosho, Oyo state residents, prevented vehicular movement on the busy Ogbomosho-Oyo-Ilorin road in protest of the non-completion of the road 18 years after the construction started .The road which serves as a link between the South West and northern parts of the country with the on-going event forced motorists to roam through untarred roads in villages and hamlets to their various destinations. The protesters who brandished placards with varying descriptions such as ‘fix our road’, ‘We are not animals; we deserve better roads’, ‘FG, Complete our road’, ‘Ogbomoso-Oyo road is our Boko Haram’, ‘Complete 18-year projects,’, all gathered at the Taki Square of the city. Among the protesters were the Christians Association of Nigerian, CAN Ogbomosho zone, the Igbo Community, Hausa Community and other socio-cultural groups. It was claimed in a statement which was signed by some of the churches executive members, that 15 people lost their lives weekly and 780 deaths are usually recorded in a year and multiplied by the 18 years since the road was awarded, it shows that an average of 14, 040 persons have lost their lives on Ogbomoso-Oyo road which is alarming and calls for urgent completion of the express road under construction. The indigenes and inhabitants of Ogbomosho land therefore appeals to the Government of the Federal Republic of Nigeria, under the leadership of President Muhammadu Buhari, to rush actions on the construction of the Ogbomoso-Oyo part of the Ibadan-Ilorin road.